The above is an excerpt from one of the many online conversations that Mike and I routinely have when discussing the art for Prismata. Perfecting the look and feel of everything is hard, as all details—even tiny changes in hue—can have a big impact on the narrative. As this discussion illustrates, things can get quite controversial! Unfortunately, pandering to false stereotypes (such as those concerning which types of colour are used at which types of bars) is often necessary in order to develop characters, settings, and themes in the way that is intended. In the end, we did keep some hints of purple in the hues. 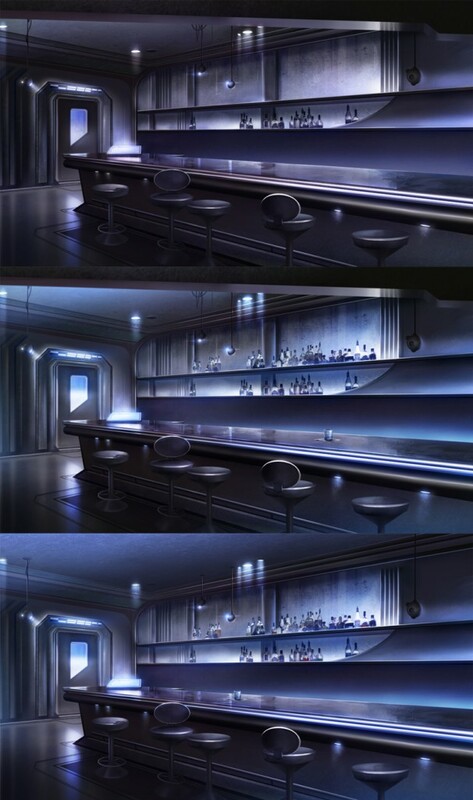 The final version of the bar scene, by artist Sebastian Wagner. Yeah, it’s purple. Deal with it. Much of our background art, like the bar scene above, is designed to serve as a backdrop for the visual novel cutscenes acting as the pre-mission and post-mission cinematics in Prismata’s single-player campaign. In these cutscenes, the various characters are positioned in front of the art, and a text box displaying character dialogue sits over most of the bottom third of the screen. There are many steps involved in putting these scenes together. After the initial contract with the artist is signed, the first step is to provide the artist with a short design description or “brief”. Depending on the subject matter, the artist then produces a few quick designs or “concepts”, which may include hand-drawn thumbnail sketches, 3D models, or mock-ups using photographic textures. After we provide feedback, the artist then completes the rendering of the final image, possibly sending us several works in progress (“WIPs”) for comments during the intermediate stages. Three concept sketches for the bar scene. We went with #3. Should we have chosen a different one? The place should not look well-taken-care-of. The wall behind the bar is probably a simpler design and the arrangement of the bottles less orderly. In fact, there might even be dust on some bottles, and there should be not much of a selection to choose from. The place shouldn’t looked trashed, but several things should look like they’re broken without any intention of ever being fixed. Maybe there’s tape on the leg of a chair. Maybe one or two of the barstools don’t match the others, etc. Coming up with these descriptions is often the hardest part. I interviewed Mike to discuss his creative process in designing settings in Prismata. Elyot: So what’s important when designing a bar? Mike: As a former wine trade professional, I’ve been involved in bar planning and know that each and every detail matters. The type of wood used for the bar countertop, the percentage of square footage occupied by tables, and the acoustics of the room all contribute to the “feel” of the establishment. Elyot: Did you have any crazy ideas for a futuristic bar? 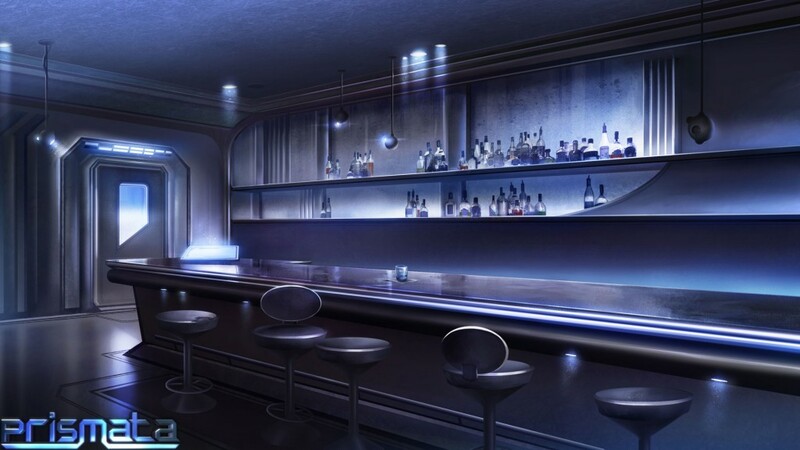 Mike: Despite my experience, it was still a little daunting to be responsible for coming up with the specs for a fictional bar in Prismata, set centuries in the future on a foreign planet. There was no real frame of reference for what it would be like. Would the bartenders be robots? Could you sit at a table for four and drink with perfect holographic representations of your friends who are dialing in from their own bar thousands of miles away? Elyot: How did you come to a final decision regarding the bar’s appearance? What led you to write the description that you did? Mike: Ultimately, I considered a character-driven approach. Without spoiling too much, let’s just say that our protagonist has seen better days. I think the kind of after-work bar for someone like him might not be so different whether the year is 1930 or 2530. It’s the kind of place where one might converse with the bartender in short declarative sentences, in between long intermissions of the background music half-muting the silence. It’s probably just crappy enough to ensure that the seats to the left and right of one’s spot at the bar will remain unoccupied. There are never any drink specials, and trivia night might consist of the single question of what ever happened to that guy who used to sit at the other end of the bar, and there are no right or wrong answers. The bartender is definitely human. His name is probably George.